Commercializing technology is a long and complicated process that sometimes leads you in unexpected directions. Who can forget about the big pharma case of the little blue pill that was to be a heart treatment that instead became famous for its alternative benefits? Or what about the failed 3M glue that became the Post It note? And while the greatest technological inventors often have lofty visions (Microsoft's original lmission was "a computer on every desk and in every home, running Microsoft software”), the daunting task of taking a given technology to market is met with a variety of challenges along the way. Arguably, it is easier to commercialize truly innovative technology when you are a company that has billions in revenue but most of us don’t. Even these companies that do face challenges, as Toyota did with the Prius, and Google is now with the launch of Google Glass. 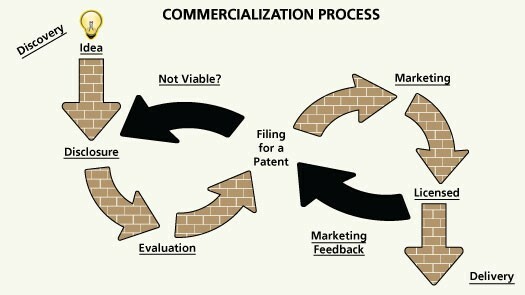 Commercializing the future of technology requires a special mix of processes, tools, and rules, a mix that changes with time, the market, the product, etc. Though most of us are still figuring out what the best magic mix is as it is not static, here is what I have come up with so far in regards to what commercializing innovative technology requires. To commercialize any given technology, one needs to prioritize not the love for the invention, but also the interest for it to reach the most number of people or the best market position. This often means that one must change – and be flexible – along the way to look to the market drivers, not just the desires of the innovator. Sometimes, the market isn’t ready for the technology you have developed. Sometimes, you struggle to find funding and investors. And other times, the technology has to be transformed to fit a need it wasn’t originally intended for. All these things aren’t taken into account on an academic technology curve and require a flexibility that isn’t necessary explained in a book. Every new product and every new invention starts with the evolution – the creation – of an idea, but the notion of creativity doesn’t end with the product. A truly creative and innovative product will often exist far before the market demand is seen – hence why one needs to also be creative in how you take the product to market. In essence, you have to find the messaging and value rationale to make the market feel that it needs your product. To commercialize technology or to take it from early maturity to late maturity, one needs to be benchmarking heavily the competition, but then look to change the paradigm and position ones product differently. If your competitors don’t have what you do, they will certainly find ways to mimic and capitalize on your gains so the need to build and defend comparative advantage never ceases. All of this requires a very different mindset from those that usually are in charge of R&D or early stage technology companies. Certainly there is the rare case of technology that is well suited and has a life of its own vis-a-vis market adoption, but overall, I have found that very few technologies go from zero to a hero without walking into an evolving market "need" gap. To find this gap, you must have your finger on the pulse, surround yourselves with others that can test your assumptions, and truly understand your market. In general, I think the lesson I have learned about commercializing technology is that you not only need to be creative on the technology side, you need to be creative on the commercial side. How many great technologies never had the chance to reach their potential and shine because they didn't have the right commercial team to make it happen? My advice to all technology teams whether large or small is don't operate in a silo. Very early on look for those with commercial expertise and creativity that you can partner with to achieve success. Likewise, don't see the commercialization process of technology as a necessary evil or something that must be grudgingly accepted. Instead see it as a critical aspect of achieving your goal as a technology innovator. Only by marrying the very best of technology and commercial expertise is market leadership possible and a technology will "cross the chasm."